2) In a small bowl, mix together the tahini, cinnamon, cranberries, rice syrup, maple syrup, vanilla, sea salt and walnuts. 3) Scoop out middle of apple and core. 4) Stuff each apple with the tahini mixture. 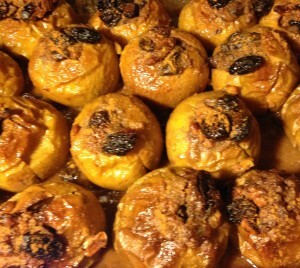 5) Place in a small baking dish and pour the juice in the pan and over apples. 6) Bake for about an hour or more, depending on apple variety.